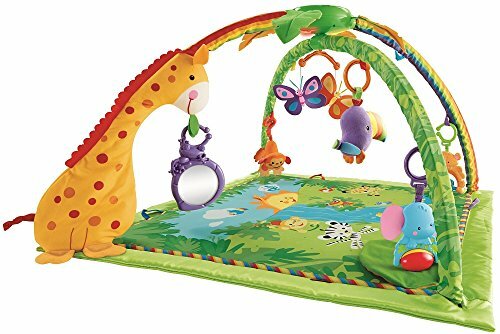 The Fisher Price Play Gym, particularly the Fisher-Price Rainforest Gym, is a great tool to put a lot of fun and learning in your baby's playtime. The exotic rainforest world is captured by this edition by incorporating the animals, rainforest music, and lights. The gym provides different textures that spur the learning of growing babies while they are playing or at rest. The Fisher Price play gym features a comfortable quilt with silky soft borders, and a friendly giraffe that supports the colorful arches. These arches have links where you can hang a figure above or attach a toy below. The gym also includes a toy paddle and toy animals such as a parrot, elephant, jingly toucan, and a monkey. Some of the toys are movable and thus allow babies to explore the gym overhead or even during tummy-time fun. It also features a crinkly leaf for you to play peek-a-boo, a shiny mirror, and spinners with butterflies and rattling beads. Furthermore, it has four amusing rainforest tunes that play up to 20 minutes. Moreover, the Fisher Price gym rainforest features 5 linkable toys that the baby can reposition. This way, your baby can work with his imagination and exploration. The friendly giraffe can encourage the baby to push up on his tummy. Upon touching, the butterflies spin and the lights are activated. Sound and music can be played by kicking the roller ball. Thus, you have a complete set of amusement for the baby. This is great because the sounds and movements that the baby sees is perfect for this stage. Babies are developing all the time, so they need some encouragement. The Fisher Price Play gym is suitable for newborn up to 1 year old babies. It features a sit and play mode to let the babies play while seated. It also allows for tummy-time playing. This way you do not have to worry about your baby outgrowing it because babies can still use the gym until they are one year old. Obviously, this is an advantage, because it is definitely a cost-saver for any parent. The Fisher Price Rain forest Gym does a very good job by putting a lot of hanging items for the babies to play with. And because the toys are detachable, you can lower them so that even small babies can play with them. As the baby grows, you can move the toys to a higher position. It is sturdily built and enough attention is put into the finer details. Proof of these is the felt leaves and the giraffe. I just wonder about how the baby will react if it is old enough to know that giraffes live in savannas. But since the product is for babies, we can let loose and be less accurate. Obviously, Fisher Price has a good name, so you would not expect that this is something that is going to give up the ghost too quickly. The product has a colorful fabric that does not shrink or fade when washed. In saying that, it is always a goood idea to take care with brightly colored objects and wash them in cold water. Wash them with care, using a delicate fabric softner to ensure that they last. It is also interesting to hear that the sounds and music are not all that annoying. Irritating music is a common problem with baby and kids products and I should commend Fisher Price for incorporating good music into the gym. The music is reinforced by the lights that fade along with the music. Also, the electronics do not consume a lot of energy because the C battery that I used lasted for many months. First of all, once you have assembled the bars, you will find it hard to separate them and put them in the box. You have to exert extra effort, to the point of worrying whether the poles will break or not. But because the poles are built to last, you won't have to stress about damages. Another thing that needs improvement is the quilt. The mattress is not as thick as the other products but that can be remedied by adding an extra layer. There are a few things that I think the company would improve on in their next play gym editions. Nevertheless, I wouldn't think the few negative points here, would be quite enough to write the product off. The pros still outweigh the cons at the end of the day. At the moment of writing, I have found this is actually a bestseller - so you have to decide for yourself!